As we waited for the snow to start this morning and watched it fall this afternoon, my kiddos and I opted for some indoor snow fun. This was especially great for me because although I like to watch it snow and I enjoy the days off of work when it snows, I'm not crazy about going outside and getting cold and wet in the snow. But unfortunately for me my kids love it, so I'm sure I'll be out there before it melts. Today, however, I enjoyed the warmth of my house and few little creative things. First we started with a little cotton ball painting. I borrowed this fabulous idea from another Kindergarten teacher on my team. I was going to try it with my students, but you'd have to actually have school to do the activity and I thought my own kids would love it too. The idea is to use a cotton ball to dab white paint onto blue construction paper to make the three circles in a snowman. I knew there was no way that my 22 month old daughter would be able to dab a snowman shape, so I drew a snowman outline for her to try to dab in the lines. Then I gave her a little bit of white, washable paint in a little plastic cup. I used an empty mandarin orange fruit cup, but applesauce cups work well for little bits of paint too. They don't take them for recycling in my area and if the cup gets too gross to clean out, then I don't feel too bad for throwing it away. What was I saying? Oh yes, I gave her the paint and the cotton ball, showed her how to dab the paint on the paper, and told her to dab inside of the circles I had drawn. She started off really well, but by the time she had finished her paper resembled a blizzard and I actually had to pry the paint infused, mashed up cotton ball out of her hands. "I paint more. I paint more," she repeated over and over. I think she likes to paint, but I could be wrong. Here's a little look at her almost finished product. My four and a half year old son on the other hand, had no trouble whipping up a cotton ball dabbed snowman. He told me he did this at school, which may be the reason for the ease of it, but if he did I haven't seen the project yet. Then we had to let them dry for a couple of hours before we could decorate. The bummer about cute painting projects is that they usually involve some down time for drying. I did have my son dab some cute little hearts with red paint too, but that was for something completely different. I figured I had the paint out and since we have to wait for it to dry too, I might as well try to extend the painting time as much as I could. After the painting had dried, I asked my son what we needed to add to our picture to make it look more like a snowman. "What do you need for a snowman?" Now, if I had really been thinking this out, I would have brought home the book All You Need for a Snowman by Alice Schertle. Its a really cute book about everything you need to build a snowman. 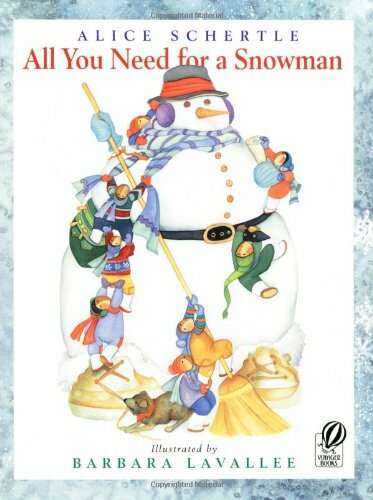 You should check it out if you're looking for snowman books or thinking about extending this activity with literature. My son actually knew what a snowman needed without me giving him extra background knowledge with the story. When asked him what the snowman needed, he replied with, "Well, he needs coal for the eyes." Since we were all out of coal, we used a marker to draw the eyes on our snowman. After the eyes, my son told me that we needed buttons. I didn't have any buttons either, so we glued beads on in place of the buttons. I put three bead on my snowman, but my son told me he needed four buttons on his snowman because he was four years old. When I asked him what else the snowman needed, he said, "Well, he needs a jacket." I told him I didn't have a jacket, but what else could we put on our snowman to keep him warm. He said, "How about a hat?" I showed him a couple hats and scarfs that I had made out of construction paper and he chose his favorite and glued them on his snowman. "What else do we need?" I asked. "A button nose," was my son's reply. I'm all for creativity but I said, "what else could we put on for a nose?" (Since we already had buttons you know.) He said, "What about a carrot?" A carrot sounded great. We talked about the shape for a carrot (a long, skinny triangle) and drew it on with an orange marker. Then my son told me that we needed to add a corncob pipe. What? Then I realized where he was getting his snowman information, "...with a corncob pipe and a button nose and two eyes made out of coal." A jolly round of "Frosty the Snowman" followed, but my son wasn't quite sure what a corncob pipe was so I explained that it goes in the snowman's mouth, whoops, our snowman didn't have a mouth. My son drew a mouth of brown "coal" on his snowman and although I showed him what a corncob pipe looked like by drawing it on my snowman, he asked if I would draw the corncob pipe. After that all that was left were the stick arms. As a final touch we added cotton to the bottom of our picture so that the snowman looked like he was sitting on snow. Now, anyone who really knows me, knows that I abhor cotton, so this craft brought me way out of my normal crafting supplies comfort zone especially when we had to pull the cotton balls apart for the snow bottom, but our snowmen turned out really well. Perhaps tomorrow my kids will actually get me outside to build a real snowman.